This natural body powder is soothing and drying after a bath or shower. Made with Arrowroot Powder, Rice Powder, Corn Starch and natural Kaolin Clay. Can be used on sensitive skin. It is unscented. This body powder is 100% natural and is made with Arrowroot Powder, Rice Powder, Corn Starch and pure, natural Kaolin Clay. It is unscented. It is beneficial for both men and women and can be used on sensitive skin. 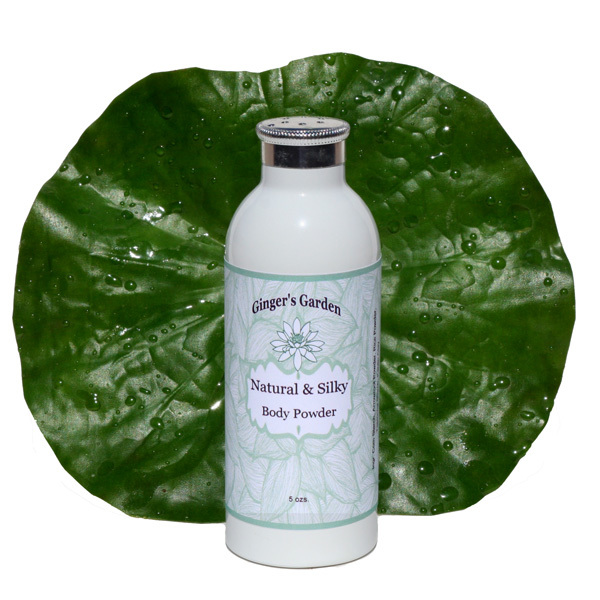 Ginger’s Garden Body Powder is soothing on the skin after a bath or shower. Use before going out on a hot sticky day to help keep you cooler. Leaves your skin feeling soft and silky and helps prevent chafing. Natural Body Powder contains no talc and is a good alternative to commercially made body powders. To use, shake some powder into your hand, then apply to skin. Each container is 5 ozs and has a twist open and close shaker top. It is made from paper and can be recycled after the body powder is gone. Make this body powder a part of your regular routine after a relaxing bath or a brisk shower. It will help keep your skin feeling dry and fresh. Living in hot Palm Springs, this body powder is a necessity. Sprinkle some in your shoes or socks to help keep them dry too. If you prefer, I can add some essential oils or a fragrance. Let me know your scent of choice in the comments section if desired. Natural Body Powder Ingredients: Arrowroot powder, Tapioca Starch, Rice powder, Kaolin Clay.